The ELEMENTAL HERBOLOGY line has a very simple mission statement, "To restore equalibrium where environmental, lifestyle, and hormonal fluctuations dramatically alter the natural mechanisms of your skin." So it makes sense that they have collections for each season when temps sore and plummet. Let's look at one product I'm liking for summer. 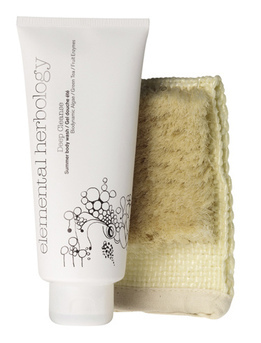 Their Deep Cleanse ($42/6.7oz only @ elementalherbology.com), which is for the body, from the Summer Daily Essentials group, uses key fruit enzymes to control sebum production, which from what I’ve read can go wacko in the high temps. It cleans and moisturizes the skin without stripping it dry. Just listen, or rather read, this list of ingredients: olive, apple serum, lemon, grapefruit, mandarin on the fruit size and then green tea, aloe vera and bisabolol (a well-known anti-inflammatory) to name few to indulge the skin in supreme antioxidants.